Sometimes we take the little things for granted. A stranger opening the door for you. Finding a failed meter right in front of the expensive valet. Take that! Realizing that your favorite food truck is in front of your office. This year, on Thanksgiving, I am thankful for my family, great friends and all the little things that put a smile on my face. 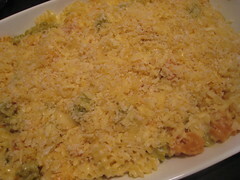 Inspired by the Mac and Cheese from bay cities that put a smile on my face after a long week at work, I decided to make my interpretation of Mac and Cheese for my Thanksgiving Potluck. I know that Thanksgiving is next Thursday, but I will be eating my way through the motherland - Hong Kong and Shanghai. 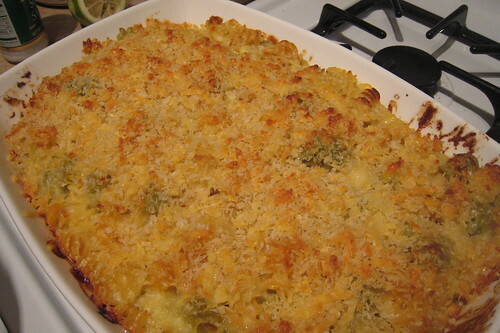 The following is my version of Mac and Cheese. Like me, it is Asian American. I used panko breadcrumbs instead of white bread to create a light crispy topping. And also like me, it tries to be health. Instead of regular pasta, I used gluten free vegetable pasta, but with the 3-cheese sauce, you will never know the difference. Enjoy! 2. Butter a 3-quart casserole dish, set aside. 3. Place panko bread crumbs in a medium bowl. 4. Toss with 2 tablespoons of melted butter. 5. 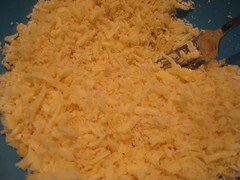 Combined ½ cup parmesan reggiano, ½ cup fontina and 1 ½ cups of sharp white cheddar. 6. Bring a large pot of salted water to a boil. 7. Add noodles and stir well to separate. 9. Drain the noodles at once and rinse with very cold water. Reserve. 10. Reserve about 1 cup of pasta water. 11. 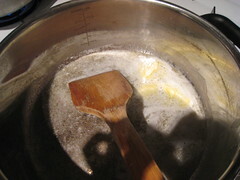 In a medium saucepan, melt 6 tablespoons butter over medium heat. 13. Gently whisk in milk. One cup at a time. 14. Bring to a simmer. 15. Add bay leaf and nutmeg. 16. Simmer until thick, 20-30 minutes. 17. Add 2 teaspoons of salt and 2 teaspoons of pepper. 18. Remove sauce from heat. 19. 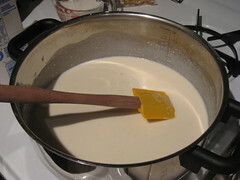 Stir in remaining cheese. Set aside. 20. Stir the reserved pasta into the cheese sauce. 21. Add 1 cup of pasta water. 22. Pour mixture into the casserole dish. 23. Sprinkle topping onto the top. 24. Bake until browned on top, about 30 minutes. 25. Cool for 5 minutes and enjoy! I'm a second-generation, Asian American foodie who is discovering myself through the world of food. I love Yelp! Read about what I've been up to when I'm not blogging about food! Recent reviews by Virginia D.
All rights reserved. All contents copyright ©, ThisFoodiesLIfe.